A woman walks east on West King Street toward the intersection with Appalachian Street during the 1990s. Image courtesy of the Downtown Boone Development Association Collection (Dow-Boo-1-013), Digital Watauga Project. Since its formation in the late 1980s, the Downtown Boone Development Association (DBDA) has worked to revitalize downtown and accommodate a thriving central business district in the Boone community. The color slide images shown in the forthcoming DBDA Collection capture fragments of daily life in downtown Boone during the mid-1990s. These images reflect the efforts of they Downtown Boone Development Association as it evaluated the town’s architecture and the functionality of its public spaces. Items in this collection depict the architectural and economic character of downtown Boone, showing building facades, parking lots, directional street signs, pedestrians, and automobile traffic. Also seen are the familiar buildings that house contemporary downtown businesses like the present-day Boone Saloon on West King Street and the current ECRS location on Howard Street. This intriguing series of snapshots showing Boone’s recent past evokes curiosity regarding what the town has been before and what it might become in the future. Seen here in the 1990s is the present-day Boone Saloon Building, originally known as the Carolina Pharmacy #2 Building. Image courtesy of the Downtown Boone Development Association Collection (Dow-Boo-1-001), Digital Watauga Project. Originally known as the Hamby and Winkler Building (1937), this building on West King Street housed the Our Daily Bread Delicatessen in the 1990s, its present tenant today. Image courtesy of the Downtown Boone Development Association Collection (Dow-Boo-1-010), Digital Watauga Project. In 1993 the Town of Boone began participating in the NC Main Street Program, seeking to preserve Boone’s distinctive historic and cultural identity while stimulating economic development. These images were part of a broader assessment of how well the town reflected the points outlined in the Downtown Boone Vision Statement, which emphasized efficiency regarding parking and traffic, architectural aesthetic, public safety, and preservation of Boone’s continuity as a mountain town with a distinctive landscape and local history. The vision statement articulated the comments and concerns expressed during a 1993 public meeting attended by over 150 community members. To view these images is to see like a developer. The photographer’s eye is drawn to that which is perceived as needing improvement as well as that which is thought to show the more exemplary and preservation-worthy aspects of downtown Boone. The initiative of the DBDA is to create an authentic downtown atmosphere that is made one of a kind by the presence of Boone’s historical architecture and the Blue Ridge Mountains. The desired outcome is economic vitality and to open the town to commercial possibility. The former W. R. Winkler Warehouse/Masonic Hall (1949) is seen in this image as the Heilig-Meyers Warehouse during the 1990s. Most folks might think this building is gone, but in fact its walls served as the structure for the present Watauga County Administration Building. Image courtesy of the Downtown Boone Development Association Collection (Dow-Boo-1-007), Digital Watauga Project. The W. R. Winkler Building (1927) endured the indignity of having its brick painted and an ill-suited, cable-hung awning applied during the middle period of its architectural history. Seen here in the 1990s, the building originally had a double-entrance configuration. Mast General Store later reconfigured the two entrances into one, removed the paint from the brick, and removed the cable-hung awning. Image courtesy of the Downtown Boone Development Association Collection (Dow-Boo-1-058), Digital Watauga Project. By the 1920s downtown Boone already had a thriving commercial district consisting of several businesses, including Qualls Hardware, the Watauga County Bank, the Critcher Hotel, and the New Edison car dealership. While most of downtown Boone’s first businesses disappeared long ago, Boone Drug and Farmer’s Hardware have withstood the test of time and remain in business today. On the one hand, this points to the timeless necessity of tools and medicine. On the other hand, it speaks to the ability of these businesses to read the town and respond to the dynamism of its local culture. Several of the images in this collection picture familiar architectural forms housing unrecognizable contents and businesses. It’s an uncanny reminder that places are alive, that a town is an ongoing process animated, in part, by the collective spirit of the people who live there. Furthermore, these images show that local history is constantly unfolding before our eyes as decisions are made, demands are met, and cultural landscapes are shaped. This collection is a terrific one to visit and ponder the interplay between the town of Boone’s architectural materiality, its institutions of development, and its collective, ever-changing, socioeconomic sense of self. Keep an eye out for the Downtown Boone Development Association Collection, which will appear soon on Digital Watauga’s website. Visible at left in the 1990s is the building on the north side of Howard Street originally known as the Boone Tire and Bargain Store Warehouse (1944), followed to the east by the building originally known as the Baker-Commack Hosiery Mills Building (1944). The latter building is presently home to The Local restaurant and features a massive wooden porch structure on its south elevation. Image courtesy of the Downtown Boone Development Association Collection (Dow-Boo-1-070), Digital Watauga Project. Warmuth, Images of America: Boone, 22-23. Each semester, Digital Watauga asks its interns to select some aspect of a collection on which the intern has worked to explore in greater detail for a blog post. Our intern for Fall 2017, Ashley Parker, worked on three collections: 1) processing and archival re-housing of the forthcoming Paul Armfield Coffey Collection, 2) scanning, metadata entry, and uploading of Box 6 of the Palmer Blair Collection (now online), and 3) scanning, metadata entry, and uploading of the Von and Mickey Hagaman Collection (now online). Costumed participants (and a chicken!) from the 1949 Watauga County Centennial posed for this image by local photographer Palmer Blair. Mickey McGuire is at far left with a pumpkin on her knee. Image courtesy of the Digital Watauga Project, Von and Mickey Hagaman Collection (Von-Hag-1-020). Nestled in the Appalachian Mountains of North Carolina, Watauga County is a place known for its extraordinary landscapes and rich history. Before European colonization, the indigenous Cherokee nation inhabited the area that became Watauga County. The word “Watauga” itself is taken from the Watauga River, a Cherokee word that has a range of theorized translations including “beautiful waters” and “river of plenty.” During the mid to late eighteenth century early American pioneers began exploring and settling the Appalachians. Among these early pioneers was the famous Daniel Boone, who allegedly camped with some frequency in the vicinity of Watauga’s county seat of Boone, lending his name to the town. The county itself would not be formed until 1849 from the southern portion of Ashe County as well as parts of Caldwell, Wilkes and Yancey counties, and Boone did not incorporate until 1872. In 1949 Watauga County reached a major milestone in its history—the 100 year anniversary of its founding. That year county leaders led by Stanley Harris, President of Watauga Centennial Inc., organized a massive six-day Centennial celebration. The festivities began on July 5 and lasted until July 10, with each day being themed: Governor’s Day, Pioneer Day, Education Day, Youth Day, Farmer’s Day, and Worship Day. Within this schedule, centennial events included a parade, contests for “Queen of the Centennial” and “Watauga Pioneer,” as well as a historical pageant on the history of Watauga County titled Echoes of the Blue Ridge. This production included twelve vignette, each telling the story of a different period of Watauga history, including a dance representing the natural formation of the area before human settlement and entries addressing the history of the Cherokee and their interactions with the De Soto expedition, Daniel Boone’s hunting cabin in Boone, the formation of the county, and the establishment of the Appalachian State Teacher’s College. The pageant concluded with the entire cast joining together onstage for a “Grand Finale” that symbolized optimism for the future. Woody Richardson donned this recreation of a Civil War military uniform as part of the 1949 Watauga County Centennial festivities. Image courtesy of the Digital Watauga Project, Von and Mickey Hagaman Collection (Von-Hag-1-013). One important part of the Centennial celebration was the Queen of the Centennial contest. About seventeen ladies from the county were nominated for the title by various organizations sponsoring the Centennial. When spectators purchased tickets to the events, they were allowed to select their choice for Queen. Votes for Queen were determined by the number of tickets sold in the candidate’s name. Among the candidates was Mickey McGuire, nominated by the Chamber of Commerce. McGuire was very popular and well known throughout town because of her job at the Boone Drug Company on King Street. By the end of voting, McGuire held over 96,500 votes, winning the contest. McGuire was crowned on the Centennial’s opening night, wearing a dress made for her by Mrs. Ethel Teems, who also worked at the Boone Drug Company. As part of her Queenly duties, McGuire gave the opening speech for the celebration, welcoming all of the spectators and visitors to the week-long festivities. Mickey McGuire posed in her Queen of the Centennial costume for Palmer Blair, a local photographer who shot many of the commemorative photos of the 1949 Watauga County Centennial. Image courtesy of the Digital Watauga Project, Von and Mickey Hagaman Collection (Von-Hag-1-001). The entire event featured impressive attendance by people from all over Watauga County coming together to celebrate their history. According to Mickey McGuire Hagaman, Queen of the Centennial, nearly everybody in the county participated; even people from outside the county came to take part in the celebrations. Participants dressed in costumes related to the history of the Appalachians. People who marched in the parade dressed as pioneers driving wagon trains, Native Americans, and Confederate soldiers. Many men who participated grew nineteenth century-styled beards in preparation for their costumed appearances. In addition to costumed participants the parade included various floats from local organizations, marching bands, and a color guard. The color guard was made up of servicemen from all branches of the military, including Von Hagaman, who was in the Navy. Von Hagaman married Mickey McGuire about a year after the Centennial ended. Local photographer Palmer Blair also shot this image of the 1949 Watauga County Centennial Parade color guard marching down West King Street from west to east. Von Hagaman is visible as the second man from the right. The 1875 Watauga County Courthouse with its unusual corner entrance on the first floor is visible at right in the distance. Image courtesy of the Digital Watauga Project, Von and Mickey Hagaman Collection (Von-Hag-1-030). Due to the overwhelming popularity of the Centennial celebration, community leaders realized how important celebrating history could be for bringing communities together and drawing in tourists. They decided to put on the Echoes of the Blue Ridge pageant again the next year to continue celebrating the history of the county. Echoes of the Blue Ridge ran for two years until 1952, when playwright Kermit Hunter was hired to write a new drama on the history of the county and surrounding area. Hunter was already well known for his work on other popular outdoor historical dramas in the Appalachians, including Honey in the Rock, a Civil War musical drama in West Virginia, and Unto These Hills, a history of the Eastern Band of Cherokee performed in Cherokee, North Carolina. The drama Hunter wrote in 1952 was titled Horn in the West and told the story of Western North Carolina’s involvement in the Revolutionary War. This summer Horn in the West celebrated its 66th consecutive season and is the oldest Revolutionary War outdoor drama in the country. Horn in the West continues to draw tourists from all over the country to Boone each summer to celebrate the history of Western North Carolina. Many of the images contained in the Von and Mickey Hagaman Collection document this pivotal, centennial event in the history of Watauga County. The Digital Watauga Project is grateful to Rosemary Virginia, the daughter of Von and Mickey Hagaman, for her generosity in making these images available to the project. Allan Scherlen, "What In The World Is Watauga?," Mountain Times 38, (April 27, 2000), http://libres.uncg.edu/ir/asu/f/Scherlen_Allan_2000Apr_what_in_the_world.pdf. “”Camped Here 1760-69” Newspaper Clipping,” Digital Watauga, accessed December 5, 2017, http://digitalwatauga.org/items/show/5822. 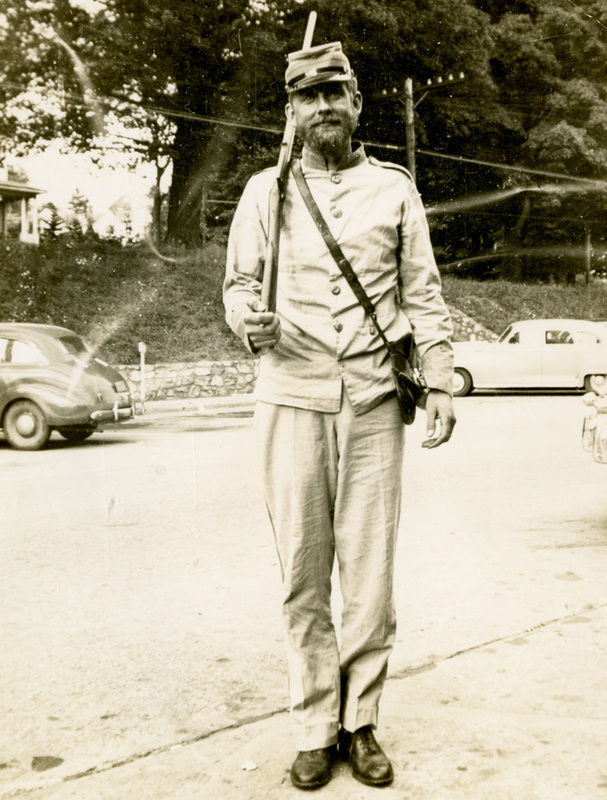 Daniel Jay Whitener, History of Watauga County: A Souvenir of Watauga Centennial (Boone, North Carolina, 1949), https://babel.hathitrust.org/cgi/pt?id=uva.x001317192;view=1up;seq=60, page 33. “Watauga County, North Carolina Centennial Papers”, W.L. Eury Appalachian Collection, Appalachian State University, Boone, North Carolina,http://www.collections.library.appstate.edu/findingaids/ac642. Whitener, History of Watauga County, 55. Whitener, History of Watauga County, 57. Watauga Democrat, “"Rev. Gragg is Pioneer; Mickey McGuire is Queen" Newspaper Article,” Digital Watauga, accessed December 5, 2017, http://digitalwatauga.org/items/show/5816. Whitener, History of Watauga County, 56. Mickey Hagaman, interview by Ashley Parker, December 4, 2017. Palmer Blair, “Palmer Blair Movie Collection #3: 1949 Watauga Centennial Parade, Part 1,” Digital Watauga, accessed December 5, 2017, http://digitalwatauga.org/items/show/5846. “'Horn in the West' opens Friday, opening night discount for Watauga residents”, Watauga Democrat, June 20, 2017, http://www.wataugademocrat.com/community/horn-in-the-west-opens-friday-opening-night-discount-for/article_d196fc34-9d13-57ac-9bc1-37cf96de0237.html. The Watauga County Historical Society is proud and pleased to give a shoutout to our friend, colleague, and fellow WCHS member, Dr. Gary R. Boye, who is the Music Librarian and a professor at Appalachian State University. His new website, A History of Film Exhibition in Watauga County, covers the tangled web of cinema venues throughout the county from 1905 to the present. Gary's website is in its early stages, with pages that currently document film exhibition at the American Theatre in Shulls Mills (1918-1921) and the Wonderland Theatre in Blowing Rock (1922-1928, burned 1933). But there is much more on the way, so be sure to check it out and check back from time to time! First advertisement for the American Theatre at Shulls Mills, March 21, 1918, Watauga Democrat. Screenshot from the Clarence A. Price Home Movies showing young girls carrying live cats in the 1949 Watauga County Centennial Parade as they pass in front of the Jones House on West King Street in Boone, NC. As some of our regular visitors know, historic film footage of Boone and Watauga County that is available for free online has been limited over the past few years. Until now, three films in particular have drawn a great deal of attention. One of these is the infamous H. Lee Waters 1936 film of Boone and the Cove Creek vicinity, which was shot as part of his "Movies of Local People" film series. (You can read more about this film here: http://www.wataugacountyhistoricalsociety.org/blog-1/2016/9/27/identifying-the-people-and-places-in-h-lee-waterss-1936-film-of-boone.) As we reported last fall, the original 16mm version of this film has long been presumed lost, but the WCHS is now working on a lead on where it might be. We are told that the original reel of this film (which is missing from--and was never included in--the large collection of H. Lee Waters original reels and production materials at Duke University) may be located here in Boone. We are working with a potential contact to secure this reel and have it digitized using the latest digitization equipment. Stay tuned. A second film shows a 1937 train excursion from Tennessee to Boone as folks travel aboard the East Tennessee and Western North Carolina Railroad ("Tweetsie") to Watauga County for an ASTC football game. The most interesting footage occurs after the lengthy football game section of the middle of the film, right around the 4:10 mark, when students are seen waiting to board the train near campus. At 5:17, the train makes a stop in Shull's Mills. Thereafter, shots out the train window show Grandfather Mountain and the Western North Carolina scenery. Still another film that apparently served as a late 1950s/early 1960s promotional film for Appalachian State Teachers College has recently surfaced. While the focus is on ASTC, the film nevertheless shows some excellent footage beginning at the 7:10 mark of Grandfather Mountain, Linville Caverns, Tweetsie Railroad, Horn in the West, and Downtown Boone. The film features a panning shot (9:00 mark) of the front of the Appalachian Theatre, where Imitation of Life (1959) starring Lana Turner is shown on the marquee. Our friends from the Archives and History Committee of the Appalachian Theatre of the High Country (thank you, Gary Boye and Craig Fischer!) tell us that this film ran at the Appalachian Theatre from Sunday, June 28, to Tuesday, June 30, 1959. Now, though, Digital Watauga is ready to vastly expand the available historical footage of Downtown Boone, thanks to the generosity of Janie Price King of Sunset Beach, NC, who has graciously donated her father's home movies to Digital Watauga. We first became aware of this collection in 2014, when a friend passed along a copy of a DVD of this footage to a member of the Watauga County Historical Society. The video below contains all footage from this composite DVD of the Clarence A. Price Home Movie Collection that was compiled by a commercial video transfer firm in the 2000s. In 2016, Digital Watauga arranged a formal donation of this copy of the original DVD to Digital Watauga as a gift from Janie Price King. Janie Price King's parents, Mr. and Mrs. Clarence A. Price, managed the Daniel Boone Hotel on the north side of West King Street in Downtown Boone, where the Daniel Boone Condominiums are now located, for many years, and their daughter Janie was a frequent subject in the silent, 8mm footage shot by Clarence A. Price. The Daniel Boone Hotel, built 1925, was a grand (for Boone!) establishment that dominated the hill above Downtown Boone. Sunday dinner at the hotel was considered "legendary," but by the 1970s, the hotel was in decline. The hotel was demolished shortly after it was listed in the National Register of Historic Places in 1982. Due to a digital processing error, the frame rate used in creating the Clarence A. Price Home Movies DVD sometimes does not match the proper frame rate for the footage, creating the "jumpy," digital blur that sometimes appears when subjects are in motion. In addition, the poor quality of the original reels sometimes causes the footage to flutter or cycle through its frame. There is no way to correct these issues on this video file. In response to these issues, though, Digital Watauga arranged with Ms. King in late 2016 to re-digitize the original home movie reels one at a time using the latest, high-resolution digitization equipment. Of the 26 surviving reels, 10 had deteriorated to the point that they were no longer able to pass through projection equipment. As a result, this footage from the DVD contains some scenes that survive in no other location since they can no longer be reproduced from the original reels. Most notably (and sadly), the footage of the 1949 Watauga County Centennial Parade is one of these reels that cannot be re-scanned. The high-resolution transfers of the remaining 16 reels are being uploaded separately by Digital Watauga. Noteworthy scenes include frequent shots of the south side of West King Street (opposite the Daniel Boone Hotel) in Downtown Boone, particularly between present-day Appalachian Street and Depot Street; footage of the new mail truck featuring Palmer Blair (25:30); the 1949 Watauga County Centennial Parade, misidentified as the "Boone Centennial" (33:40), with Palmer Blair again (35:07); the January 21, 1950, fire at the Appalachian Theatre (54:50); the 1950 May Day Celebration at Appalachian State Teachers College (1:02:20); the 1950 Echoes of the Blue Ridge Parade (1:14:36); and the 1953 May Day Celebration at Appalachian State Teachers College (1:42:46). Numerous Boone landmarks are visible throughout the footage, including the Daniel Boone Hotel, the Appalachian Theatre, the Boone Post Office, and the Jones House. Digital Watauga is in the process of creating a Clarence A. Price Homes Movies Collection interface on its website, DigitalWatauga.org, but since the YouTube link had to come first, we wanted to bring it to you first. The other individual reels will also be uploaded to YouTube, with connections back to the collections page. Stay tuned. "Don't pay the dates on the [title cards] any attention. I think the people who originally put the reel-to-reel footage to the disc went by the dates on the reel canisters, which [indicate] when the film was developed, not when the events occurred. "PAINTING THE HOTEL--The two men are Ralph Wilson (Gail's uncle) and a Mr. Vannoy. "CHICKEN ON A LEASH--The old couple are my paternal grandparents. "WINKLER'S CREEK--The old man is Walter Horton, who none of you probably knew. He lived in Miami in the winter, but came to Boone every summer and operated Horton's Fish Camp, a group of cabins on the right side of Winkler's Creek Road beyond where Eddie Paul lived but before where the road takes the sharp left around the rocks. "MAIL TRUCK--Daddy was taking pictures of what evidently was a new postal service truck. The other man also taking pictures is Palmer Blair. "ETHERIDGE FAMILY REUNION--This was my mother's family in Wilson County, NC. The old lady in the wheelchair is my maternal grandmother. "WATAUGA COUNTY CENTENNIAL PARADE --There is a brief shot of Dr. George Moose before the parade starts. You can see Palmer Blair again, and the old man riding the brown horse with the red ribbon around its neck is Walter Horton again. "CHURCH PICNIC--This was at Hound Ears [Shull's Mills vicinity] before it was developed. "JANELLE--She's in a lot of the footage; she is one of my cousins. "MISS BROCK'S NURSERY SCHOOL--It is easy to pick out Miss Brock, but difficult to recognize anyone else because we're running around outside, and almost everyone is wearing a hat. I can find myself only because I remember the gray/maroon hat and jacket that I'm wearing. Jane Buckland is the girl in the bright yellow bathing cap; don't remember the reason for that. Pam is wearing a red hat and coat; you can see her blond curls sticking out from under the hat. I think John Stacy is the boy wearing the plaid coat and matching hat. I think Graydon is wearing alight blue coat and red hat. Chuck is bound to be in there somewhere, but if he isn't the boy who is hatless, I don't know which one he is. The boy climbing the fire hydrant is Stevie Hodges, whom probably no one else remembers unless it would be Ed Brown or Joe and Bob Todd. Stevie and his older sister, Olivia, lived behind the hotel on Orchard St. in the first little white frame house on the left. They moved away about the time we started the first grade." Digital Watauga extends its profound thanks to Janie Price King and the Price Family for their remarkable generosity in sharing this vital film record of Boone's past with Digital Watauga. Senator Estes Kefauver (D-TN) and his wife Nancy vacation at Mayview Manor in Blowing Rock, NC, in August 1956. This image was shot by Palmer Blair and appears in the forthcoming Palmer Blair Collection of the Digital Watauga Project, which will be available online beginning next week. The mountains of North Carolina possess a certain charm and appeal that has called to farmer, politician, student, sightseer, and thrill seeker alike. However, the state of North Carolina is more than just a tourist destination. Historically, North Carolina has proven important during presidential election years. While the state voted Republican in every election from 1968 until 2004, from 1932 until 1968, North Carolina possessed a strong Democratic hold that politicians took advantage of. In the 1952 presidential election, for example, North Carolina was one of only nine states to vote in favor of the Democratic Party. Despite the failure of the Adlai Stevenson-Estes Kefauver ticket in the 1952 election, Tennessee Senator Estes Kefauver hoped to spread his Democratic influence to the surrounding southern states while running for president again four years later. Once again, though, despite Kefauver’s strong showing in the primaries, the party relegated Kefauver to second fiddle behind Stevenson. In August 1956, one week after the Democratic National Convention, an “overtired” Senator Kefauver and his wife Nancy retired to Blowing Rock, North Carolina, for a vacation before returning to the campaign trail. These images from the Palmer Blair Collection, which will officially join the Digital Watauga Project online next week, document Kefauver’s visit. Born July 26, 1903, Kefauver served as a Democrat in the US House of Representatives from Tennessee from 1939 to 1949. Following his election to the US Senate in 1948, Kefauver was perhaps best known for his involvement in the United States Senate Special Committee to Investigate Crime in Interstate Commerce, otherwise known as the Kefauver Committee. Under Kefauver’s leadership, the committee was established May 3, 1950, and remained active for a total of fifteen months. In that time, the committee held hearings in fourteen states concerning drug trafficking, prostitution, burglary, murder, and other forms of organized crime that were being hidden by corrupt politicians, judges, and police officers. As many of the hearings were televised, the American public was able to catch a glimpse of organized crime in the nation, while the hearings elevated Kefauver’s status as a man set on defending the people of the United States. Indeed, by early 1951, Kefauver’s work uncovering local, state, and national organized crime syndicates was familiar to some 72% of Americans. Despite his loss of the Democratic presidential nomination in both 1952 and 1956, Kefauver was still well known and well liked by the general populace, and the party saw his presence on the ticket as critical to winning southern states in the general election. Following the two unsuccessful Stevenson-Kefauver campaigns in 1952 and 1956, Kefauver would remain a member of the United States Senate until his death in 1963. During his 1956 trip to Blowing Rock, Kefauver was accompanied by his wife Nancy, whom he referred to as his “secret weapon” due to her charming nature. Born near Glasgow, Scotland, Nancy met Estes when she was visiting her aunt in Chattanooga, Tennessee, after studying art in Paris. Due to Nancy Kefauver’s talent and passion for the arts, President John F. Kennedy appointed her the first director of the Art in Embassies Program in 1963, a position of global acclaim in which she flourished until her death in 1967. As a couple, the Kefauvers exerted lasting impact not only on the state of Tennessee, but national and global relationships. 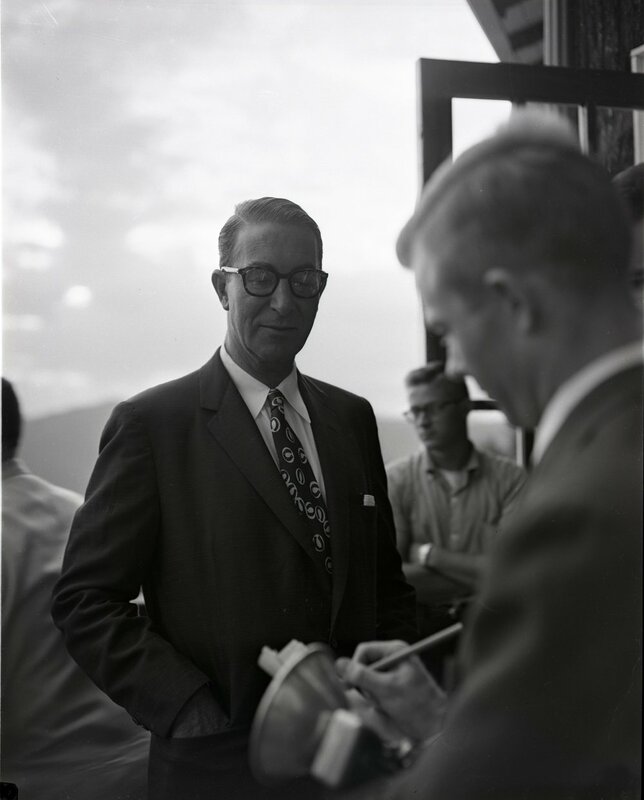 Reporters interview Sen. Estes Kefauver (D-TN) at Mayview Manor in Blowing Rock, NC, in August 1956. This image was shot by Palmer Blair and is part of the forthcoming Palmer Blair Collection, Digital Watauga Project. While in North Carolina, Estes and Nancy stayed at Mayview Manor, the “Queen of Blowing Rock Hotels,” where they were well received. Mayview Manor was a grand hotel of 138 rooms that was built in Blowing Rock in 1921, catering to patrons until the hotel shut down in 1966. The building then stood vacant until 1978, when it was demolished to make space for housing developments. Advertised as “In the heart of America’s Alps,” Mayview Manor served as a picturesque getaway for those seeking to escape city life for a vacation in luxury and opulence. Situated on the edge of the John’s River Gorge, the hotel offered stunning views of the surrounding mountains while providing a picture of sophistication inside. Striving to make “every guest feel that they are the most important guest in the hotel,” Mayview Manor exemplified excellence and top service. The magnitude of Mayview Manor’s property allowed it to host a number of annual meetings and gatherings, from conventions of the North Carolina and South Carolina Cotton Men to road shows by sharpshooter Annie Oakley. The ample space, stunning views, and location relatively close to their home meant Mayview Manor was also an ideal vacation spot for Senator and Mrs. Kefauver following the grueling months of the primaries and the national convention. Rest and recreation were fleeting, though. Met with a slew of manor employees, North Carolina politicians, reporters, and photographers, the Kefauver family shook hands, took pictures, and attended parties while they reveled in the beauty of the North Carolina mountains. Mayview Manor as it appeared in August 1956. This image was shot by Palmer Blair and is part of the forthcoming Palmer Blair Collection of the Digital Watauga Project. Shot by Palmer Blair, a Boone photographer who was active between 1946 and his death in a plane crash in 1957, these few images of the Kefauvers at Mayview Manor are just a small glimpse into the forthcoming Palmer Blair Collection. Consisting of thousands of negatives, the collection will be uploaded to Digital Watauga in stages, as portions of the collection are catalogued, scanned, and appropriately described. Any given photographs in the collection serve as a starting point for research into Watauga County’s fascinating and often influential history, and they provide a comprehensive picture of how Watauga County has flourished and grown. Stay tuned for future announcements about the new and exciting Palmer Blair Collection, coming soon. “‘Overtired’ Veep Candidate Rests with Wife at Blowing Rock, N.C.,” Kingsport Times (TN), August 23, 1956, Newspapers.com (by subscription). Oral History Interview with David R. Hayworth, February 6, 1997. Interview I-0099. Southern Oral History Program Collection (#4007) in the Southern Oral History Program Collection, Southern Historical Collection, Wilson Library, University of North Carolina at Chapel Hill. Watauga Democrat, (Boone, NC), March 13, 1924. http://newspapers.digitalnc.org/lccn/sn82007642/1924-03-13/ed-1/seq-1/#date1=&sort=date&date2=&searchType=advanced&sequence=0&index=4&proxdistance=5&rows=20&words=Manor+Mayview&phrasetext=mayview+manor&dateFilterType=yearRange&page=1; “Annie Oakley’s Love of North Carolina.” Annieoakley.July 20, 2012. http://annieoakley.org/2012/07/20/annie-oakleys-love-for-north-carolina/. The Boone Fork Lumber Company Commissary at Shulls Mills, NC, from the forthcoming Lowery-Whiting Collection, Digital Watauga Project. The Digital Watauga Project is pleased to announce that it has officially made the move to our new web home, effective today. Our new website address is now DigitalWatauga.org. You can find all of the same content from our old Digital Watauga site over at the new location, plus much more that will be launching in the coming days. This move actually represents a much-needed change in webhosting providers. When Digital Watauga first went online in late summer 2015, we launched using the Omeka.net interface and relied on Omeka to provide our webhosting. For those not in the know, Omeka is a web publishing platform that was designed by the Corporation for Digital Scholarship at George Mason University for use by archivists, educators, libraries, museums, scholars, students, and the general public to display content and build digital exhibitions, often in collaboration. While originally designed as a content platform rather than a webhosting service, Omeka.net eventually offered server space for a fee in order to make Omeka more widely accessible to those without independent and secure server options for interaction with public users. For obvious reasons, this solution was the best for Digital Watauga in its infancy. A police officer on the streets of Boone searches a box of jars with clear liquid found in the trunk of a car licensed in Tennessee (date unknown, but probably early 1957). The Dacus Radio Shop is visible in the background. Image is from the forthcoming Palmer Blair Collection, Digital Watauga Project. Enter Reclaim Hosting. Founded in 2013, Reclaim offers hosting options for individuals and institutions, with the vast majority of their users having education-focused content. Most importantly, their hosting fees are substantially less than those on Omeka.net, and they offer much higher storage limit levels as part of their standard pricing options. We became aware of Reclaim shortly after we initially launched, but we were also aware that they were still working through some growing pains. When it became clear that Reclaim was offering the Omeka web application AND had designed a relatively seamless method for migrating content from an existing Omeka platform to Reclaim’s servers, we couldn’t pass up the opportunity any longer. The move will save the Digital Watauga Project many thousands of dollars in the years to come. That frees up resources for securing new collections, improving our scanning capabilities, and ultimately offering much greater access to the historical materials our users seek. Now that this migration has occurred, we will be uploading thousands of items in several new collections that have been waiting on the sidelines for the move to be completed. Stay tuned for a major announcement about these new collections sometime during the week of November 10. We’ve included a couple of images from those collections in this blog entry as a tease of what’s to come. Shown here is one of the images from the Buchenwald Concentration Camp collection recently offered by an anonymous donor to the Digital Watauga Project. We believe that the image may show US soldiers speaking through the Buchenwald barbed wire with Russian prisoners who had escaped from Buchenwald and were the first to greet US soldiers from the Sixth Armored Division of the US Third Army. These Russian prisoners then led US troops back to Buchenwald to liberate the camp and were held for extensive interrogation about the camp by US forces. The image is shown here courtesy of the United States Holocaust Memorial Museum, which is now the rights holder of these images as of October 27, 2016. As many of you know, the Digital Watauga Project is dedicated to digitizing the photographic images and documents associated with the history of Watauga County, North Carolina. In some cases, the large, cohesive collections that we add to Digital Watauga include some images that document locations, people, or events from outside of Watauga County. One example is the Bobby Brendell Postcard Collection, which includes a handful of postcard images from the Asheville area, Ashe County, and Avery County that Brendell inadvertently included in his Watauga County postcard containers. We chose to retain these images as they represent Brendell’s management and cataloging of his collection and highlight parallels between Watauga County and those other areas in western North Carolina. 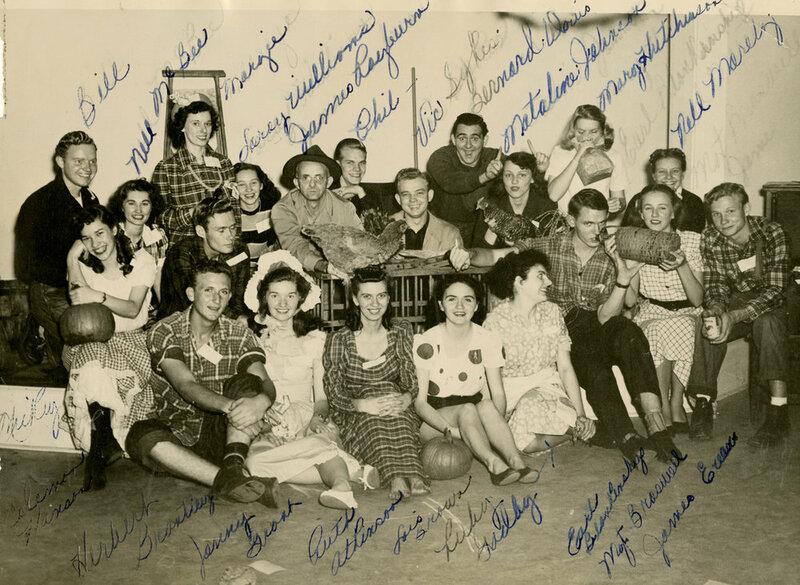 Another is the Junaluska Heritage Association Collection, part of which contains images of soldiers serving in the European theatre after World War II. We included these photos in Digital Watauga because most of them document Junaluska residents during their period of military service overseas. Sometimes, though, we are offered collections that have compelling historical value but have little or no relation at all to Watauga County. These collections force the Digital Watauga Project Committee to confront difficult choices about maintaining the integrity of our project and its mission statement while also serving the needs of our donors by identifying appropriate public outlets for and providing best practices guidance on the long-term preservation of their collections. One such recent donation involved a small group of commercially produced postcards from the 1930s to the 1950s that consisted entirely of scenes in central western North Carolina and eastern Tennessee, primarily in the Asheville area and the Great Smoky Mountains. Because the collection was not directly relevant to our mission, our only choice was to return the collection to the potential donor with our sincere thanks for the opportunity to review the collection. We also recommended to the donor alternative repositories where the postcards might find a more appropriate home. Earlier this year, an anonymous donor approached us with another such collection that, quite frankly, startled us because of its stunning historical significance. Consisting of thirteen photographic negatives, the collection’s images were originally produced by a US Army soldier who assisted with the liberation of various sub-camps in the Buchenwald Concentration Camp system near Weimar, Germany, on April 4 and April 11, 1945, prior to the arrival of high-ranking Army officials on April 14 and their official, documentary photographers on April 24. As you might expect, most of the images are harrowing and deeply disturbing. They feature many of the scenes one might expect to find in a raw, unfiltered, documentary view of one of the worst genocides ever perpetrated on the planet. Upon receiving the collection, our digitization technician (Paul Fuller) worked with one of our interns (Grayson Butler) to digitize the images so that we could first confirm that they were really from Buchenwald. I personally conducted the research that confirmed their authenticity. Particularly helpful were two images portraying the body of a Nazi SS officer who had been badly beaten and stabbed during an uprising at the Ohrdruf sub-camp just prior to the arrival of US forces. These two images from the new collection show the man’s body before it was moved into position near a second Nazi SS officer’s body, as seen in a relatively well-known color photograph taken by Lt. Col. Parke O. Yingst (the later, more famous Yingst image can be seen HERE, but readers are warned that the photo is quite graphic). Other images among the negatives from our potential donor were clearly from the main Buchenwald camp. After lengthy consideration of these facts and my own confidential conversations with the prospective donor about the origin and significance of the negatives, the Digital Watauga Project Committee (DWPC) voted unanimously to decline acceptance of the negatives as a gift to Digital Watauga. In addition, the DWPC authorized me to meet with the donor again, recommend to the donor that the negatives be given to the United States Holocaust Memorial Museum (USHMM), and communicate with the USHMM on behalf of the donor. While it took some time to work out all of the details, I finally traveled this past Thursday to Washington, DC, to meet on the donor’s behalf with Chief Acquisitions Curator Judith Cohen at the USHMM and hand-deliver the negatives to the Museum's permanent care. As Ms. Cohen indicated, some of the images depict scenes not previously known to the Museum, particularly those showing survivors. Staff at the USHMM expressed several times how grateful the Museum is to receive the images and add them to their collection. The Digital Watauga Project is proud and honored to have been part of helping our prospective donor find the right archival home for this important collection of photographic negatives. We hope this peek behind the scenes highlights Digital Watauga's level of commitment to preserving our collective history, whether it involves local people, places, and events from here at home in Watauga County or the most historically significant moments from half a world away. Women marching in the July 4, 1919, parade through Boone turn right from West King St. (then known as "Main Street") onto today's College Street in front of the First Baptist Church (built 1916, demolished 1936). Image courtesy of the H. L. and Gladys Coffey Collection, Digital Watauga Project. The Digital Watauga Project is excited to announce the addition of a new collection to the Digital Watauga Project--the H. L. and Gladys Coffey Collection. This new collection will appear on Digital Watauga in waves as we work with the donor to secure thematically related images documenting the early history of Boone and Watauga County. During our visit with the donor today, Paul Fuller--our digitization technician--and our chairperson, Eric Plaag, picked up a total of seven historic photographs and three significant postcards portraying images not previously known to our project. The photographs, which are attributed to H. L. Coffey, are especially rare. Several document the July 4, 1919, parade in which dozens of veterans of the Great War (WWI) took part. At least two of these images show what is believed to be the second iteration of the Boone First Baptist Church, which was built in 1916 and stood on the SW corner of West King and College Streets, where the current (third) version of the church now stands. Another image in the collection shows West King St.--then known to most folks as Main Street--looking west from a position near today's Boone Town Hall. Visible on the right side of the photo are the large trees that still stand in front of the Jones House, while at the right center of the image is a clear view of the J. D. "Crack" Councill House, which was torn down to make way for the US Post Office in the 1930s. West King Street (then known as "Main Street"), looking west, during the July 4, 1919, parade. The trees at the Jones House are on the far right, which the J. D. "Crack" and Emma Councill House can be seen at right center, near the first telephone pole on the right. Image courtesy of the H. L. and Gladys Coffey Collection, Digital Watauga Project. It will take several weeks to digitize these items to Digital Watauga standards, compile the metadata, and put them in our upload queue, but we wanted to share a sneak peek of some low-resolution versions of these images with you now, while you wait. Stay tuned for more additions to this collection in the months ahead, as well as news about several other major collections that we will be adding soon! The building in this image, from the 0:31 mark in our version (0:18 in the ASU/YouTube version) has completely stumped us. Some of us think it may have been located on the west end of King/Main Street, opposite the 1904 Courthouse. Others aren't so sure. Do you know what it is and where it was? In November 2015, the Watauga County Historical Society sponsored a screening of the 1936 H. Lee Waters film of Boone, NC, and the surrounding area (including Cove Creek High School and the Sugar Grove area). We had an awesome turnout, and as you can see from the attached spreadsheet, we were able to identify about 70 places and people who had been previously unidentified in this film. H. Lee Waters (1902-1997) was an itinerant filmmaker born in Caroleen, NC. Between 1936 and 1942, Waters subsidized his income by filming 117 communities in North Carolina, South Carolina, Virginia, and Tennessee for his “Movies of Local People” series, then partnered with local movie theaters to show the films. As suggested by the article below, from the October 29, 1936, edition of the Watauga Democrat, Waters was in Boone in late October to film the locals. The Pastime Theatre then ran his film during the first week of November 1936. Article in the October 29, 1936, edition of the Watauga Democrat advertising the H. Lee Waters film of Boone. Copies and original prints of many of these films are presently held in the H. Lee Waters Film Collection at Duke University. In case you're curious, the reason for the multiple time codes in our spreadsheet is that there are actually at least two versions of this film circulating on DVD in the Boone area. We're not sure why the ASU version runs "slower" than the dub that the Watauga County Historical Society has, but both versions contain the same content, and we've accounted for those discrepancies in our spreadsheet. These two versions appear to be dubs from a duplicate reel of the original film. Numerous second- and third-generation VHS and DVD copies of these two versions survive in the area, many in private hands. There is another version that the WCHS owns, donated to us by Cecil Greene last year, which is lovingly called the "Deluxe Pink Edition." This version, which is also a second or third generation dub from the original, was not properly fixed (a photography process) when it was made, which has created the pink cast it has. Unfortunately, this is also a sign that the film is deteriorating, and it is only a matter of time before the "Deluxe Pink Edition" loses its images to the ravages of time. The original 16mm film of Boone has long been presumed lost, but the WCHS is now working on a lead on where it might be. We are told that the original reel of this film (which is missing from--and was never included in--the large collection of H. Lee Waters original reels and production materials at Duke University) may be located here in Boone. We are working with a potential contact to secure this reel and have it digitized using the latest digitization equipment. Stay tuned. In the meantime, please feel free to watch the ASU/YouTube version above, stop and start as you see fit, and let us know if you recognize anyone or see any familiar places. You can email us at wataugacohistsoc@gmail.com if you have any IDs to share with us. We'll update our spreadsheet as new identifications come in, and we'll gladly give you credit. Just be sure to indicate the ASU/YouTube time code in your email, so that we can locate the person or place you're referring to. While the Watauga County Historical Society is committed to working with institutions, businesses, residents, and visitors to digitize the images, documents, and other materials that document our county's rich history, we also recognize that others have already done some of this work. The following is a list (with links) of various resources that residents, visitors, and scholars may find helpful in understanding and interpreting our history. We welcome suggestions for additions to this list. If you are aware of additional Watauga County history resources that have already been digitized and are available online, please email us at wataugacohistsoc@gmail.com, and we'll add your link (and offer a tip of the hat to you personally for your suggestion). The Cy Crumley Scrapbook: ET&WNC Railroad Historical Photo Collection: An outstanding collection of images and information about the East Tennessee and Western North Carolina Railroad (colloquially known as "Tweetsie"), which ran from Johnson City to Boone during the first half of the 20th century. Screenshot from the 1936 H. Lee Waters Film of Boone and Cove Creek. We're still trying to identify that building behind these gentlemen, which we think was in Boone. Any idea what this is? Email us and let us know! The Watauga County Historical Society (WCHS) is pleased to announce that it will hold a public screening of the 1936 H. Lee Waters film documenting the people and streetscapes of Boone and the surrounding area. This screening will occur on Tuesday, November 10, from 5:00 to 7:00pm at the Watauga County Public Library. But this is no run-of-the-mill movie screening. We actually need your help. While the film itself is relatively short and fairly well known among Boone residents, the goal through this event is to better identify the individuals and buildings that appear in the film. The WCHS will show the full film (approximately 11 minutes long), then show a series of screenshots from the film, asking for those in attendance to help us identify the buildings or people in the screenshots. We especially encourage long-time Boone and Watauga County residents to attend and help us identify and properly credit the people who shaped our past. Using this information, the WCHS will then create a full list of identified individuals and locations, linked to the film by time code, and make this information available to the public through the Belk Library at ASU (which owns a circulating copy of the film), the Digital Watauga Project, the Watauga County Public Library, Duke University, and other outlets and organizations. H. Lee Waters (1902-1997) was an itinerant filmmaker born in Caroleen, NC. Between 1936 and 1942, Waters subsidized his income by filming 117 communities in North Carolina, South Carolina, Virginia, and Tennessee for his “Movies of Local People” series, then partnered with local movie theaters to show the films. Copies and original prints of many of these films are presently held in the H. Lee Waters Film Collection at Duke University. The original 16mm film of Boone is presumed lost, but numerous second- and third-generation VHS and DVD copies survive. Members of the public who attend this screening and assist with this process will be thanked publicly on the WCHS website. UPDATE: The November 10, 2015, event was a huge success, and with help from numerous folks, we were able to identify nearly 70 individuals and locations in the film that were previously unknown. We are currently working on syncing time codes between our version of the film and a second version that is also circulating online, and we hope to publish those results in late 2016. In the meantime, a very special thanks to Terry Harmon, Robert (Bob) Cook, Cecil Greene, Mary Helen Cole, Sarah Lynn Spencer, Sharon Blair Tolbert, Linny (sp?) Trivette, Ted Hagaman, Flavel Eggers, Elizabeth Phillips, Bettie Bond, and Lenore Pipes for their memories and insights in helping us with identifications! In case you've never seen the film, you can view it for yourself right here! Our Winter 2016 campaign, conducted through Generosity.com, is intended to cover a substantial increase in digital storage costs as we transition from 5 GB of storage to 25 GB of storage (the next tier) in late 2016, as well as defray ongoing personnel costs for a part-time digitization coordinator to lead our large team of volunteers during the 2016-17 cycle of digitization. Many thanks to the following individuals who donated to our Winter 2016 campaign! On June 3, 2015, the State Library of North Carolina announced that it has awarded one of its 2015-16 LSTA EZ Digitization Grants totaling $25,000 to the Digital Watauga Project. Stemming from a partnership between the Watauga County Historical Society and the Watauga County Public Library, the Digital Watauga Project is designed to permanently digitize Watauga County’s remaining visual and documentary history while building trust between the community and its surviving repositories. The funds from this grant will be used to train and employ a digitization technician, purchase necessary equipment, and begin the first wave of digitization of at least 2,500 items from several prominent collections. These include 1,500 images from the Historic Boone Collection, several dozen images and advertisements from the Appalachian Theatre Special Collection, and another 750 images from the Watauga County Cooperative Extension Aerial Photograph Collection. Other noteworthy additions in the first year of the project include 80 images from the Junaluska Collection and 400 images from the Bobby Brendell Postcard Collection, which was recently donated to the Watauga County Historical Society. Also included are nine items from the 164 Carolina Avenue Collection, representing images and letters found within the walls of a Boone house during renovations by Adrian Tait several years ago. This last collection is especially significant. While small—consisting of three photographs, five letters, and one postcard—it represents exactly the kinds of privately held materials that the Digital Watauga Project is especially interested in digitizing in the coming years. Many residents of Boone and Watauga County possess important historic images and documents that are rarely, if ever, seen by the public. Because the Digital Watauga Project is focused on digitization, allowing owners of historic images and documents to keep their materials and any ownership rights once the materials have been digitized, the project is an ideal means for facilitating partnership and promoting trust between the public and its local repositories. In addition, all digitized materials will be available to the public for viewing online at no charge.